Adequate lighting is one of the most important electrical requirements in both residential and commercial properties. Not only is proper lighting practical, but the right combination of lighting will bring with it ambience and style that transforms various spaces around your home or office. Whether you need functional lights that ensure a bright comfortable room, dimmable lights that emit a warm glow for ambient lighting or accent lighting that demands attention to a special feature, our qualified electricians at Lead Electrical can help. We can assist with the safe wiring of all your internal electrical fittings, and ensure proper lighting control throughout your home or business. Need help? Ask our expert advice on which lighting best meets your needs. External lighting plays a key role in both the aesthetics and safety of your home or business. Are you looking to transform the outdoor spaces of your home into usable areas that can be used day and night? Or perhaps install some sensor lighting to improve the overall safety of outdoor areas and scare away unwelcome intruders? 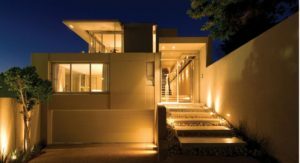 Whatever your requirement, there is a wide range of options available for exterior lighting, and Lead Electrical are here to help. Our qualified electricians can install and maintain all types of lighting systems including floodlights, motion-sensor lights, timer based lights and pool lighting.